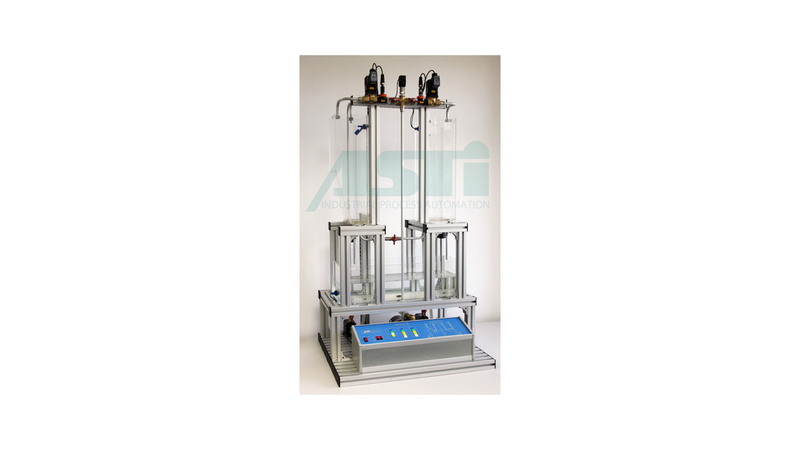 ASTANK 2 is a didactic plant for the study of hydraulic processes, implemented as a coupled tanks system set-up. The system is based on two-tank process for flow, level and pressure control and is designed as a model of a chemical plant fragment. The tanks are coupled through pipes and the goal is to apply different strategies for reactant level/water, flow and pressure control. The system has two tanks, each equipped with a pressure sensor to measure the water level. Water is delivered to the tanks by an adjustable flow pump, through a frequency converter, and, for each tank, the water flow is independently controlled by two proportional solenoid valves. The pressure of the main water feed line is measured with a pressure sensor and two flow sensors are used for measurement of each filling flow for the two tanks. Level in each tank can be independently disturbed by adding extra water with two fixed flow pumps. Also, step disturbances generation is provided by manual valves. Drain flow rates can be modified using manual valves. ASTANK 2 allows testing of various control algorithms using Siemens Simatic S7-1200 PLC for data aquisition and process controller in conjunction with a dedicated MATLAB/Simulink environment. Additionally, the plant can be equipped with a human-machine interface panel (Siemens Simatic KTP700) and PC Runtime as user interface for monitoring and process control.